cross on the right is 65'' high, 13'' wide, and 12'' thick at the base. 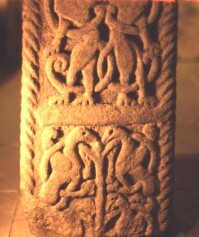 The cross is dated to the ninth century. The cross on the right has the remains of four panels on the front. The top panel is thought to be Adam and Eve with something between them, but this is very eroded. The next two panels both have a pair of beasts. The base has a tree pattern with birds. Collingwood, W.G., , ‘Anglian and Anglo-Danish sculpture in the West Riding, with addenda to the North and East Ridings and York, and a general review of the Early Christian monuments of Yorkshire’. In Yorkshire Archaeological Journal (1915) 23, 129-299.